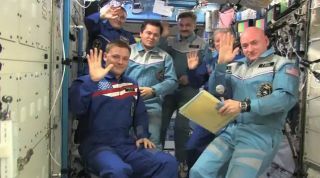 The six American and Russian crewmembers on the International Space Station wave after a change-of-command ceremony passed control of the station from NASA astronaut Doug Wheelock (front left) to Scott Kelly (right). Americans onEarth aren't the only ones giving thanks today: U.S. astronauts on theInternational Space Station are marking this Thanksgiving holiday byappreciating the support from the army of engineers, friends and family working tirelesslyto bring them home safely. The stationcrew is actually working through their spaceThanksgiving holiday since two of them ? NASA astronauts Douglas Wheelockand Shannon Walker ? will be returning to Earth tonight (Nov. 25) with a cosmonautcrewmate aboard a Russian Soyuz capsule. "We wantedto say thank you to our ground support teams to our control center in Houston andall the great work and long hours, the thousands and thousands of meetings thatyou guys suffer through for the cause of this great flying machine and the safetyof our crew," Wheelock told Mission Control yesterday. "We reallyappreciate that." Wheelock, Walkerand cosmonaut Fyodor Yurchikhin are due to return to Earth tonight at 11:46 p.m.EST (0446 Nov. 26 GMT) to wrap up a more than five-month mission to theInternational Space Station. The astronauts and cosmonaut will undock theirSoyuz TMA -19 spacecraft at 8:22 p.m. EST (0122 GMT) to begin their descent. "I justwanted to wish everyone well this Thanksgiving,"Walker said during in a holiday video message to Earth. "I hope everyoneis surrounded by friends and family and enjoying their wonderful Thanksgivingdinner together." Yesterday,the astronauts and cosmonauts tucked in to a NASAversion of Thanksgiving dinner. Precooked irradiated smoked turkey, greenbeans with mushrooms and candied yams were on the menu. The returningstation crew will land on the steppes of Kazakhstan in Central Asia, where thelocal time will actually be Friday morning. The weather at the landing site is expected to be freezing with a chance of rain or snow. Wheelock,Walker and Yurchikhin have lived aboard the International Space Station sincemid-June. They initially joined the station's Expedition 24 crew, with Wheelocktaking command of the Expedition 25 mission during a crew change in September. ? Yesterday,Wheelock turned command of the space station over to fellow NASA astronautScott Kelly, who will lead the outpost's Expedition 25 mission. Kelly willremain behind on the station with two cosmonaut crewmates when Wheelock and theothers depart today. Afterlanding, the crew will be retrieved by recovery teams and ferried to the cityof Kustanai, Kazakhstan where it will split up ? with Yurchikhin flying toMoscow while Wheelock and Walker fly back to Houston, Texas, home to NASA'sastronaut training center at Johnson Space Center. A meal of traditionalThanksgivingturkey and other fixings awaits the American astronauts on the planereturning them home. "It'sbeen an incredible journey and an incredible journey traveling through thecosmos around our Earth and looking out at our beautiful planet," Wheelocksaid this week. "I'm thankful for my crewmates and thankful for the good Earth.I'm looking forward to coming home as well." You canfollow SPACE.com Managing Editor Tariq Malik on Twitter @tariqjmalik.